Lululemon Athletica CEO, Christine Day, says "our #1 priority is meeting our guests where they are at." 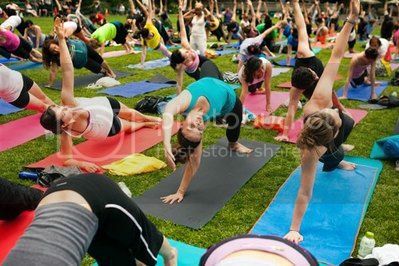 In some cases, that may be through a marathon on the streets of Vancouver, at a music festival in Whistler, on hundreds of yoga mats in New York's Bryant Park or even in a store-window, which often serves as an experiential yoga demo for the fast growing apparel giant's now 189 stores throughout the U.S. and Canada. "We don't do gift-giving and we don't do, like, special promotions, discounts, whatever," Day says. "That's not our MO, and we don't do big advertising." Instead, Lululemon has struck a note with women by using experiential marketing to support a retail footprint that has grown 220% in the past three years alone. Last month, the brand sponsored title sponsored the first annual SeaWheeze Lululemon Half Marathon and while the activewear company often uses events to creating desire, awareness and appeal ahead of launching new retail spaces, Days says that Lululemon is also seeing a strong correlation between grassroots marketing and e-commerce sales. Through a team of local ambassadors, Lululemon is able to reach scale with their events and seed awareness into new markets in advance of a retail rollout. "We do have activity going on with ambassadors, with yoga events, Yoga Journal conferences in far more markets, where we're building our relationships in advance of going in with showrooms," Day says. "Being in relationship with our ambassadors and our guests gives us the opportunity to host and support these events and is a testament to the meaningful relationships that we have built over time."